The 360 Index Head is a combination of a swiveling base module and a standard angle head. 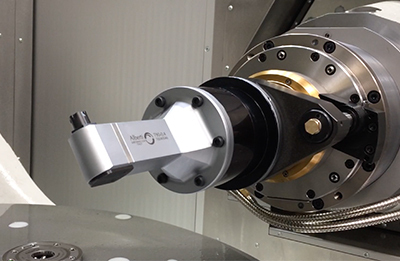 This unique angle head makes it possible to rotate and position the angle head output automatically, using the controlled axis of the machine spindle. The internal technology of the base module allows the positioning and clamping of the head with the machine spindle to achieve a variable position within a 360-degree range and then operate like a standard angle head using the machine spindle rotation. This line can only be mounted on machines with controlled C axis and external air through the Stop Block (max 6 bar). If you have a specific application that requires indexing angle heads, please contact us.